In the modern age of computers, ground-penetrating radar, PDAs and other forms of high technology, the human element is often overlooked as a key component of success on a job site. Often, no matter what tools you have, if you don't have the experience or ideas for a certain project - and don't have access to people who do - the job will not get done. Sometimes, good, old-fashioned partnership and ingenuity are called for on the job site. A recent pipe-ramming job under the runway of an airport in the scenic capital city of Caracas, Venezuela proved this to be true. This small, non-commercial airstrip does not host international airlines. It serves La Carlota military air base Venezuelan political and business figures, including President Chavez, officials, cabinet members and other assorted high-profile figures. For Estructuras Nacionales S.A.(ENSA), headed by Juan Pablo Bello Rodriguez and Juan Enrique Bello Rodriguez, success on this project could definitely have a positive impact on the future of their contracting business. Located on prime real estate, in the center of the rugged mountain valley Caracas is nestled into, the 60 m (196') wide downtown Venezuelan airstrip and an adjacent highway are prone to flooding. Moist air from the Caribbean ocean just a dozen miles to the north condenses over the nearby Mount Avila mountains and runs down, pooling on the airstrip and a nearby highway. The existing 2m (6') diameter drainage canal runs the length of the valley, underneath the highway and airstrip and drains into a nearby river, but is not large enough to do the job. As a result, ENSA was contracted to install a new canal for the valley. The project started about two years ago. The canal project includes two new side-by-side 2.5 m (feet) by 1.8 m (feet) high canals that run parallel to the existing canal, underneath the airstrip. The new canal will feature a rectangular profile to allow for larger flow while permitting a shallow installation profile to meet grade requirements. Most of the 4 km (mile) long canal construction was fairly straightforward and easy to perform with conventional excavation methods. Ground conditions were optimal, the mix of soil was favorable, and there were no buried utilities. The tough parts were the airstrip and highway - both of which had to remain active and undisturbed. Since the inception of the canal project, ENSA had been in a quandary over how to get the new canals under the highway and airstrip without damaging the surfaces - and needless to say, without digging them up. It was when the Rodriquez brothers visited Rafael Rivero, their authorized HammerHead dealer in Caracas that ENSA began to make progress. "ENSA had a lot of experience with traditional forms of above-ground excavation and auger-boring," said Martin Gross, Field Engineer for Latin America. "However, they had limited experience with horizontal directional drilling (HDD) or other trenchless underground installation methods." Rivero and ENSA first considered HDD as a solution. The initial plan was to bore under the ground structures and install approximately 50-60 individual 250 mm (10") steel pipes that would act as a support structure underneath the airstrip and highway - a kind of "roof" that would hold up the soil during excavation and that the new canals could be installed under. The approach was eventually abandoned because HDD turned out to be impractical for this particular application. After mulling over the situation, Rivero remembered a similar project, Brazil, a few years prior in which ramming had proven to be the best solution. Pipe ramming is the process of locking a HAMMERHEAD® pneumatic ramming tool to pipe, -using collets, and then pneumatically hammering the pipe into the ground. The HAMMERHEAD collet system has the advantage of quick setup without unnecessary welding of eyelets or use of straps - a few impacts of the tool itself will lock it into the collets or again unlock it when put in reverse. Ramming is traditionally used to install casings for sensitive utilities like gas. On the Brazilian job, it had been used to create a support structure with pipes so that a tunnel for a road could be built under a railroad. Once ENSA decided on ramming, the details began to take form Rivero decided to increase the pipe size to 610mm (24"), to reduce. The number of pipes needed to a total of 26. The 24" pipe also offered much better structural rigidity - which we needed to accurately hit the distance of 200 feet. The 610mm (24") pipe being rammed was fitted with a soil shoe, an additional ring of the same material welded on to provide the leading edge with more stability and leave a space around the pipe that reduces soil-to-pipe friction. In this case, with the soil shoe, about 1.9cm (0.75") was compacted on all sides, leaving an annular space of about 1.25cm (0.5") around the pipe. Once the ramming process is completed, the compacted soil returns to nearly its original state, filling the small annular space again... Cost-effectiveness, ease-of-use and power are key benefits of ramming. The airstrip project commenced on August 15, 2001. To date, 15 of the 26 pipes have been installed and the space for the canal has been excavated halfway under the runway. The other 11, plus the next 26 rams to be done for the highway, are projected to be started in early January. After the roof was rammed in, the next steps in the process included the removal of the ends of the concrete platform and additional excavation approximately one meter on either end of all the rammed pipes to allow ramming of five pipes at each end that were to form side walls. Perpendicular to this, and supported at either end of the span by an upside down U-shaped column, would be the placement of five vertical casings on each side to form the walls of the support structure. Once pipe roof and walls were rammed in, excavation under this upside-down "U" shape began. While the pipe structure supported one section's weight above in cantilever fashion, a foundation and support beams were added. Construction of each section of the support structure continued until the other side was reached and the interior of the canal could be built up. The project started with the excavation of an 18.2m (60 ft) x 22.9m (75 ft) launch pit on one side of the airstrip. Concrete was poured and leveled at the desired grade and height for the ram. I-beams were set into the concrete where the pipes would be rammed , to anchor the guide rail for the pipes to be rammed. Additional I-beams were welded to the beams in the concrete to support the pipes. A large steel I-beam was used as the guide rail, placed in the next spot and aligned carefully for each new pipe. Two pits were utilized because the crew chose to ram three out of the five required pipe lengths from one side and the other two from the opposite side. After ramming the first three or four pipes, ENSA began to look for ways of optimizing the process. With about fifty left to ram, a couple hours saved per pipe would certainly pay off. Each 60m (200') pipe was made up of 5 individual 12m (40') sections that would be welded together progressively during the ram. Each of the welds took about 3 hours, and ramming times increased significantly with pipe friction, once 2-3 sections had already been rammed. Rivero decided to excavate a second pit on the other side of the runway and start ramming from both sides meeting in the middle saved one weld per pipe. In addition, ENSA avoided the much longer ramming times for the fourth and fifth sections. To ensure that the pipes were on track, everything was mapped out, and adjustments were made on a continual basis. Even with these precautions, the crew ran into a few unexpected problems. The first pipe went in flawlessly but the second pipe rebounded off the first pipe, which caused all the spoil to kick back out. It was more a nuisance than a serious problem. The crew started the installation from the center and worked its way out left and right. After solving a number of initial problems including lubrication lines breaking, it was smooth sailing. Production averaged about 0.3 m/min (1'/min)." ENSA was extremely happy with the solution - and the dealership support. Rivero mentioned several times it was the best after-sales support they had received in their years in business. "They stayed for a total of two weeks" Rivero said "until we were confident the project was on track." Because of the success and direction of this project, ENSA has already been selected as the contractor for other projects. Asked about the future of ramming, Rivero said, "I think there are a lot of potential ramming projects that people aren't considering because they aren't aware of this process. I think that the solution that Vermeer has provided with this application will be very popular in the future." 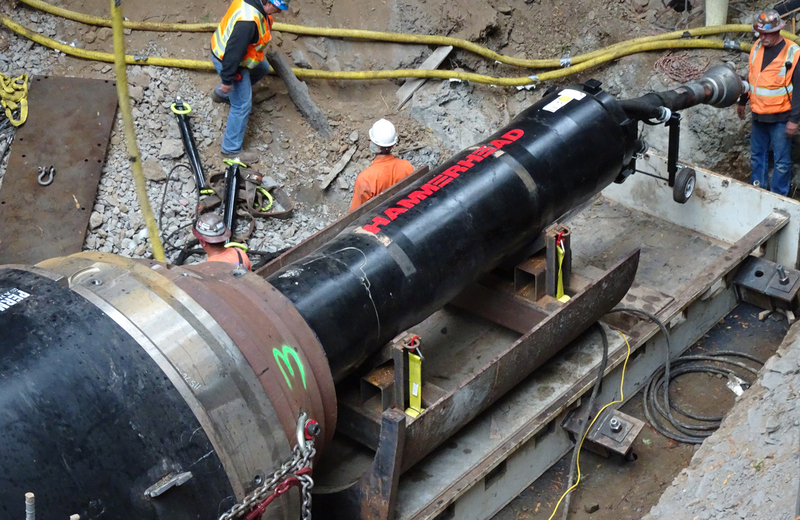 HammerHead pneumatic pipe-ramming tools lead the industry in reliability and easy maintenance.